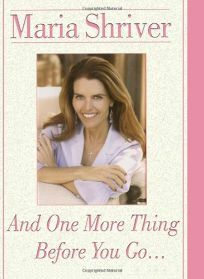 Shriver, veteran TV news reporter and first lady of California, expands on a speech she gave to her ""young friend Ally's"" graduating high school class, and the result is a sweet and inspiring book. The author of four (decidedly more substantial) previous books lays out 10 rules for success applicable to anyone, teenage or older, and though it's short, the book is eminently useful. Advice like ""fear can be your best teacher"" and ""be willing to let go of your plan"" precedes ""learn from your mistakes"" and ""you'll need a lot of courage,"" which leads to ""and when you need courage... think of the women in your life."" Although some of these directives are obvious, Shriver's delivery of them is personal and compelling. She shares anecdotes from her own life (such as her struggle to support her father, who suffers from Alzheimer's disease) and admits her mistakes (such as her ""doozie"" of forging ahead too quickly in creating the California Women's Museum without doing the proper research). Most importantly, Shriver's tone is never pompous. Rather, it's conversational, loving and rousing, and gives a big voice to this small book.